After the Vancouver Canucks found out the fate of Roberto Luongo’s injury, they called up Joacim Eriksson from the Utica Comets Friday morning. Luongo could be sidelined up to 10 days nursing a groin strain suffered in the Canucks last game against the Winnipeg Jets on December 22nd. Eriksson has played in 20 games this season with the Utica Comets in the AHL compiling an 8-10-1 record, a 0.907 save percentage and a 2.77 GAA. The Swedish goaltender has also recorded two shutouts this season. 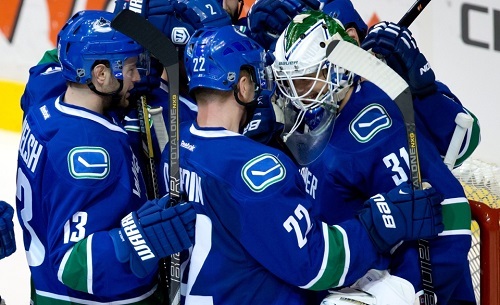 Eddie Lack will now become the man in between the pipes for Vancouver. Lack has been a great back up to Roberto Luongo this season posting a 6-2 record and a 1.93 GAA. Eddie has also won four straight and not allowed 2 or more goals in 10 of his 11 appearances in net for the Canucks this season. “I’ve always thought I was capable of playing in this league and I’ve worked hard for a long time to get here,” Lack, said Friday as the Canucks returned to practice following their four-day Christmas break. Eddie Lack has proven to be a great back up this year to Roberto Luongo. The Canucks get back into action against the Calgary Flames this weekend and will look to get a crucial 2 points in the NHL’s toughest division, the Pacific Division.